Cheap bars in central Pattaya -Soi Buakhao bars! Soi Buakhao bars – here is a selection of good priced popular bars in this area of town updated regularly. Coming in at probably the most popular bars is Nikom court at the busy junction of Soi Buakhao & Soi Diana, locally known as the junction of death. The beer here is around 65 baht for a big bottle of Leo, chang & Heineken is slightly more. The bar is self service with various food outlets offering good quality cheap Thai & farang food this includes pasta, kebabs beef sandwiches & more .You will find a real mixture of local characters & tourists chewing the cud here, make no mistake this is one cheap watering hole in central Pattaya. The age group is from 40 – 75 bracket generally living on a low budget, you will meet some really genuine people in this bar & its one of the best watering holes in Buakow. This is a fairly new bar which has been refurbished to a high standard by the owner. Here the beers are around 49 baht this place does not currently serve food, it employs around 12 attractive females. 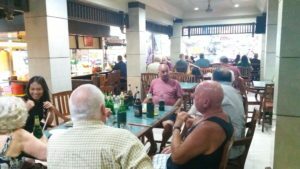 This is a very nice bar which is becoming extremely popular due to its central location , the owner Des is always around to help should you need any advice about Pattaya.